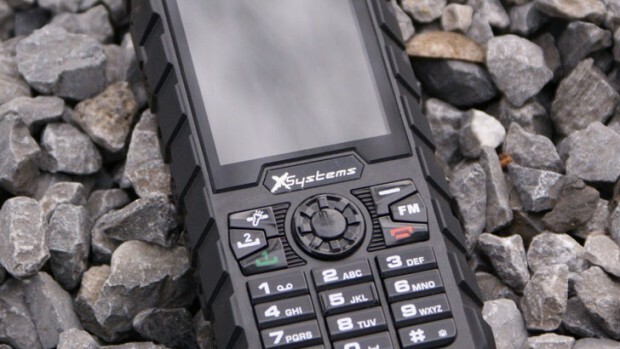 X-Systems have introduced a new feature phone called X-Tel 3500 that comes with super rugged features. The device have great price/quality ratio and this makes it one of the costliest feature phone in the market. Apart from the rugged capabilities, the device comes with basic specifications. With IP68 certificated protection X-Tel 3500 can be used even under water 2 meters, anywhere in the world where is between -20 and +80 degrees. This highly durable phone has 2.4-inch screen with a resolution of 320 x 240 pixels and is also protected by Corning Gorilla Glass 2 technology. 64 MB RAM and 64 MB which is expandable up to 32 GB obviously designed mainly for communication. X-Tel 3500 provides you with up to 15 hours of talk time, with a 2000mAh battery that promises up to 330 hours standby time. The phone has a T9 keyboard and it is working with 1Watt power LED flashlight on the top ranks. X-Tel 3500 is 17 mm thick and weighs 136.5 grams. Dutch, English, French, German, Italian, Portuguese, Russian and Spanish are supported on this device. When you need a combination of your outdoor adventures and your technology needs the X-Tel 9500 is what you need. This tough smartphone is actually ‘hexaproof’, it is dustproof, waterproof, , shockproof, oilproof, tempeproof and freezeproof. X-Tel 9500 features a 4.7-inch 1080p (1920 x 1080) IPS display with Corning’s Gorilla Glass 2 on top of it. The device is powered by Qualcomm’s Snapdragon 400 quad-core SoC running at 1.4GHz, and it also packs in 2GB of RAM and 16GB of native storage. The 13-megapixel snapper can be found on the back of this phone, and a 5-megapixel shooter is available up front. For the ultimate usage and safety. The phone has three physical keys below the display, first one answer the call, the middle one is an emergency button, and the latter one ends the call. The X-Tel 9500 does everything much faster and it has enough horsepower to tackle every day’s use, also your mobile technology freedom, at the speed of the light. On the X-Tel 9500 there is a choice out of over 1 million tech applications. Play Store offers various personal, business and technologies related applications, which are fun to use, practical or time efficient. The X-Tel has a very powerful 3800 mAh battery, a battery which lasts longer and packed for any outdoor or action sport adventure. The rugged X-Tel 9000 is special type of waterproof smartphone, which is completely shockproof and has a protective and splash-protected screen of Gorilla Glass 2.0. Engineered to be easy to use, compact and very durable. When you capture the precious moments in life with your 13.0 Mega Pixel camera you can view them on the elegant Gorilla Glass 2 which has an Full HD (720x1080p) screen This 5.0 inch Gorilla Glass display, with full HD (720x1080p) had been drop tested for 7500 times, so if you are not sure if such elegant screen can be so strong, now you will have no doubts! The X-Tel 9000 has a dictation application. There is also a built in FM radio and you need to use the headphones as an antenna. The XSYSTEMS X-Tel 9000 has a built-in 8-megapixel camera, where you can also record video. And if that is not enough, you can also use the second 2-megapixel camera for video calling. In short this durable, waterproof smartphone comes with the latest Android 4.4.2 software, 3600mAh lithium battery, which gives you working time of 8 hours and a standby time of 20 days. It is useable in between -20 / 80 C, with a LTE 4G Dual-SIM card. 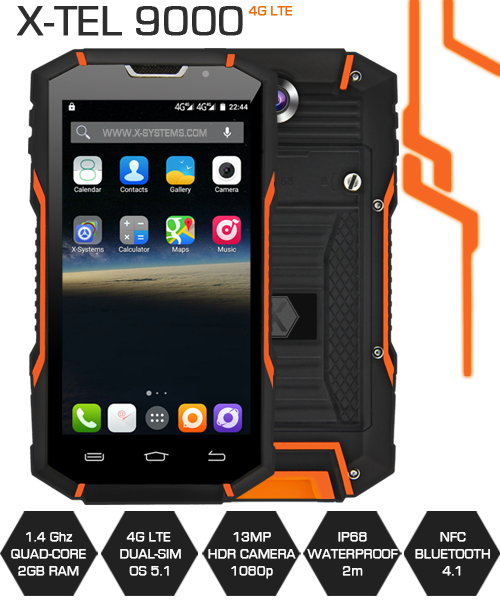 X-Tel 9000 waterproof smartphone is the best device agriculture, industrial, security, construction or outdoor professional could own. Whatever situation you’re in, these phones won’t suffer under it. An extreme waterproof tablet also known as the X-Tab 9000. The invincible waterproof tablet and the first HEXA-proof. Designed very compact, durable and easy in usage. A completely water-, dust-, freeze-, shock-, temperature and oil proof tablet with boat GPS. Useable under whatever circumstances, conditions and situations. The waterproof X-Tab 9000 has sunlight readable 7 Inch HD Screen, latest Android software (4.4.2), with over 40 languages, 4.0 Bluetooth, workable in between -20/80 C, up to 7 days standby time, 11000 mAh lithium battery, SIM card and a GPS System. At 8 megapixels, the X-Tab 9000 has a very high front camera resolution compared to most of the other tablet computers that were released in the last 12 months. Across all the tablet computers that were launched around the same time as the X-Tab 9000 the front camera resolutions range from 0.3MP to 8MP, and the average front camera resolution is 2.3MP. The X-Tab 9000 has a very high battery capacity (11,000 milliamperes * hour) compared to most of the other tablet computers that have been on the market for the last year. Comparable spec tablets that were launched around the same time as the X-Tab 9000 have battery capacities of between 2,000mAh and 11,000mAh, and the average battery capacity is 5,200mAh. The X-Systems X-Tab 9000 is 3G compatible, which is unusual. Most of the other tablet computers that have been around for around the same time as the X-Tab 9000 are not 3G compatible. X-Tel 3000 is designed to work in any extreme weather and can survive severe shock and rough impacts. The X-Tel 3000 has an extreme waterproof rugged case, for optimal protection of the internal aspects of the phone and has an ultra-strong IP68 protected, shock-, dust- and waterproof housing. Runs on Nucleus OS, comes with DUAL-SIM, Bluetooth, camera, noise reduction, hand-glove friendly, a 2.0 compact but ultra-bright IPS Hydro screen, standby time of 330Hours, 15 hours of talking time. The tough mobile phone X-Tel 3000 has highly scratch and crack resistant Gorilla Glass 2 screen and a honeycomb internal frame structure. This dustproof cell phone is specially created for calling and surfing the Internet or using application like WhatsApp is an easy task. The perfect waterproof cell phone for industrial usage, sport or other activities. This X-Tel is equipped with all the requirements you expect from a durable phone, T9 keyboard phone ideally for an adventurous road trip or intensive industrial and construction business usage. 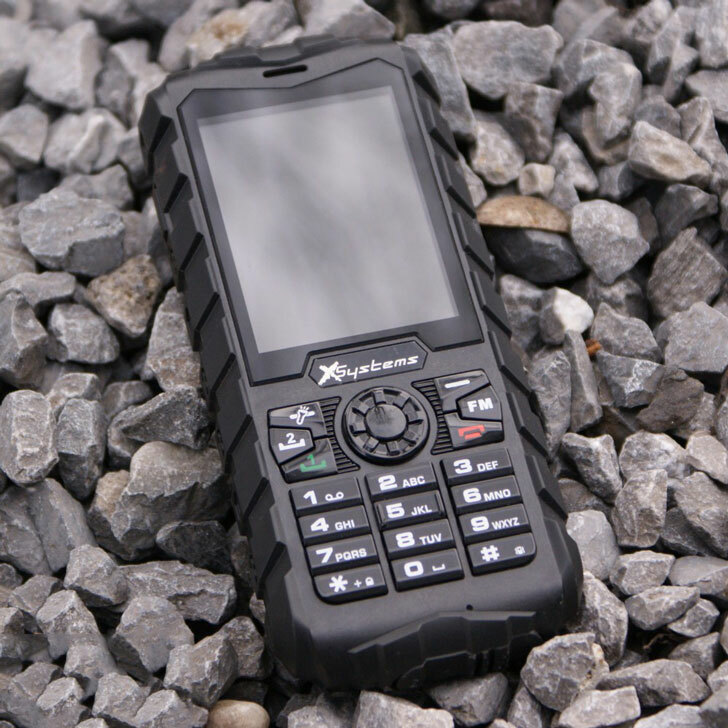 X-Tel 3000 gives you high performance, stable reliability, extreme durability and secure data. This classic designed phone can survive any condition. The T9 retro keyboard with large keys can be quickly typed even wearing the gloves. The device also supports all the major European languages like English, Dutch, German, French, Italian, Spanish, Portuguese and Russian. The X-Tab 7500 is ultra-rugged, thin and smooth. 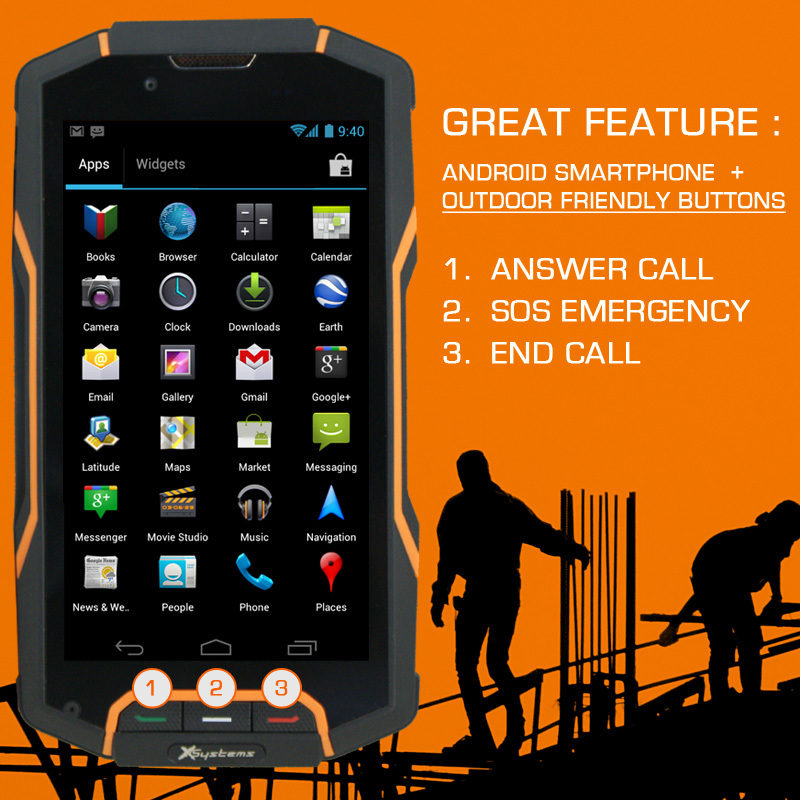 Completely water-, dust-, vibration-, drop-, and shockproof rugged tablet with outdoor navigation. Useable under whatever circumstances, conditions and situation, the X-Tab 7500 tablet is made to be durable, very compact and easy to use. Outdoor navigation tablet with 13.0 MP Camera, Whatsapp, FM-Radio, Multi-Media player, MicroSD and MicroUSB. Long lasting battery 7000mAh and lower power consumption Nucleus Android. With all these technical specification the X-Tab 7500 is known as the extreme rugged tablet with outdoor navigation. X-Tab 7500 is created to bring the best quality for a rugged tablet, outstanding outdoor experiences. Unbelievably sharp 8.0 Mega Pixel rear camera, newest type of Android Software (4.4.2) with the possibility of over 30 languages, Bluetooth 4.0, 7 Inch HD Sunlight readable, Temperature under which it is operable: -20 / 80c, Working time: 56 hours, Standby time of 5 – 7 Days, GPS, Sim possibility and a 11000 mAh very long lasting lithium battery. X-Tab 9000 is more than a tablet – it is made for an extreme use and for extraordinary user experience. Travelling and finding new adventures are much easier with rugged X-Tab 9000. It is created to live through a drop from a meter or to stay a meter under water. The X-Tab 9000 offers a pre-installed Offroad mapping, GPS trails, OpeStreetMaps and Sea Maps with a high tech Marine Navigator for easy and precise routing. X-Tab 9000 has a front 2.0 MP camera and 8.0 MP camera on the back. The X-Tab 9000 extremely tough tablet and uses both Wi-Fi and 3G data networks for accessing the Internet. This durable and robust tablet has an 8 GB SSD and extended memory storage. The X-tab is made for extreme conditions, it has a working temp of -20 to 80c with a 7inch sun light readable IPS screen and 11000mAh lithium Battery for maximum performance and reliability. This real piece of art is the second generation tablets from X-Systems. Perfect outdoor and industrial 3G GPS tablet with Wi-Fi and all other features. The tablet is engineered to be robust and durable but still very comfortable in the hand and perfect for the hardworking people who have the need of a better and stronger quality. The X-Tab 7000 is a multi-function all-weather device operating on an Android operating system. This means, which no matter under whatever environmental circumstances the tablet needs to work in, it keeps on surviving. This X-Tab is specially designed to be impact- and resistant proof. With the most advanced specifications and technology, this waterproof tablet can be taken with you, up to a meter under water underwater. The X-Tab is one of the strongest tablets ever and it’s bigger than a Smartphone yet smaller than a laptop. It matches both the professional as personal needs. In short; your perfect outdoor tablet with boat navigation! Good 8.0 Mega Pixel camera, Sunlight readable 7.0 inch HD screen, latest Android 4.4.2 software with 50+ different languages, Bluetooth:4.0, Can be used between -20 / 80c, Working time: 56 hours, Standby time of 7 Days, 11000 mAh extremely long lasting lithium battery, three boat navigation. The X-Tab 9000 is even better and titled as the “extreme waterproof tablet”, is world’s first HEXA-proof, waterproof tablet – incredible piece of technology and victorious in any aspect. Extremely compact, durable and very easy to use. X-Tab 9000 is fully dust-, shock-, freeze-, and temperature, oil and waterproof tablets. Incredibly sharp camera (8.0 Mega Pixel), 7Inch HD (1920×1080) Sunlight readable 2.0 screen, Android 4.4.2, with more than a 40 languages, Bluetooth 4.0: Using temp: -20 / 80c, Working time: 56 hours, Standby time of up to 7 Days, 11000 mAh lithium battery, GPS network and a SIM card exit. On X-Tab 9000y you can play clear music, connect, navigate, use with internet and watch or create movies. This X-Tab has a powerful 100DB speaker for amazing sound performance. 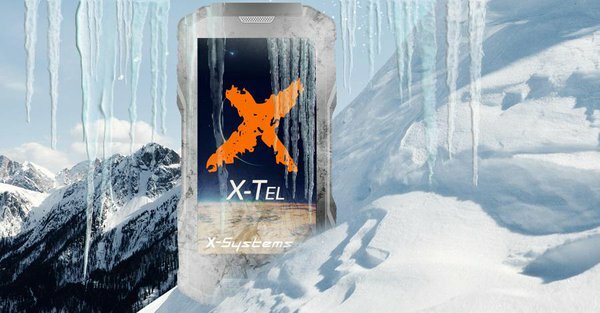 X-Tel 9500 is an extreme hexa-proof smartphone, meaning that it is fully dustproof, waterproof, and freeze proof, shockproof, tamperproof and oil proof. The phone can go under water for a couple of meters or survive dropping it down from a meter. This device can survive temperatures from -20 to 80 C degrees. X-Tel 9500 actually has an SOS-Panic button, and there are also Dual-SIM option available. You can ever use this smartphone’s display if you wear gloves, which is convenient, and kind of expected if you’ll operate it low temperatures. On top of sporting the IP68 certification for water and dust resistance, this handset also features the 810g Military Standard. The Durable Waterproof X-Tel 9500 V2 features a 4-inch FWVGA IPS display with Corning’s Gorilla Glass 3 on top of it. The device is fueled by a 2800mAh battery a quad-core SoC (Cortex-A7) at 1.2GHz and. Have in mind that X-Systems also offer an optional variant of X-Tel 9500 with a 4,500mAh battery. The X-Tel 9500 V2 also ships with 2GB of RAM and 16GB of internal storage (expandable up to 32GB via a micro SD card). The 8-megapixel snapper is placed on the back of this phone, and a 5-megapixel shooter can be found up front. Android 5.1 Lollipop comes pre-installed on this phone, and the phone weighs 170 grams. The X-Tel 9500 V2 measures 140 x 75.8 x 16.3mm.